The Carolinas Golf Association honored its outstanding players of the year and championship winners at Carolinas Golf Night. 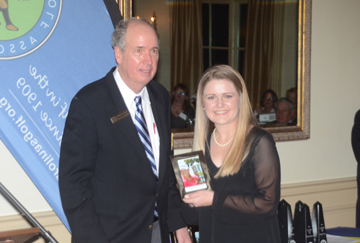 The ceremony and annual meeting of the CGA was held at the Country Club of Charleston. New President Lawrence Hicks presents outgoing CGA President Jackson Hughes a special award. 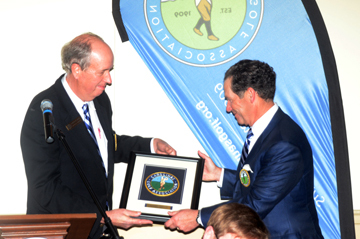 The awards night began with special recognition for the CGA’s outgoing president Jackson Hughes of Greenville. During Hughes’ two year term as president the CGA completed the building of its headquarters, Golf House in Mid Pines. It was a major undertaking for the organization and Hughes leadership was recognized by his successor Lawrence Hicks of Greensboro. The annual Richard Tuffs Awards are presented to the top players from the 2015 golf season. Scott Harvey of Greensboro was honored for the fifth straight time as the CGA Men’s Player of the Year. 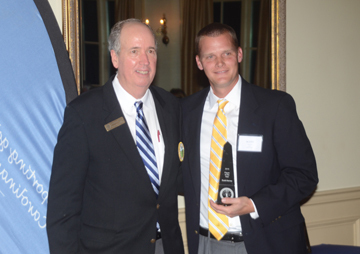 Scott Harvey of Greensboro won his fifth straight CGA Player of the Year award. Harvey won the 2014 USGA Mid-Am championship and earned an invitation to play at Augusta last year. In addition to playing in the Masters he won the South American Amateur in Peru and was a member of the 2015 Walker Cup team. Mauldin’s Ashley Czarnecki received her award as the Carolinas Junior Girls Player of the Year. Mauldin’s Ashley Czarnecki was honored as the CGA Girl’s Player of the Year. The future Wofford golfer had a sensational year. She won the WSCGA Girl’s championship, The SC Junior Match Play title, the Cobb’s Glen Junior, the Upstate Junior and the George Holiday Memorial. She also finished as the runner-up in the South Carolina AAAA girls championship, the Carolinas Junior Championship and the SCJGA Players Championship. Czarnecki also was named the Beth Daniel SCGA Junior Girls Player of the Year. Nick Willis of Cowpens was presented the David Parrott Award for his sportsmanship, ability and academic excellence. 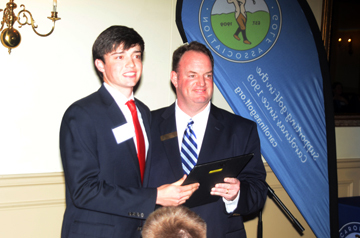 Nick Willis of Cowpens was presented the David Parrot Award by the CGA at the ceremony. Willis, a junior at Spartanburg Christian Academy, is the 2015 SC Junior Match Play Champion. He was selected from the eight members that represented the Carolinas Golf Association in the Carolinas-Virginias Junior Team Matches. The award is given annually to the Carolinas Team player who displays excellence in sportsmanship, ability, and academic excellence. Willis has made an early commitment to play college golf at Wofford. He currently has a 4.354 grade point average and recently finished 26th at the Junior Heritage.